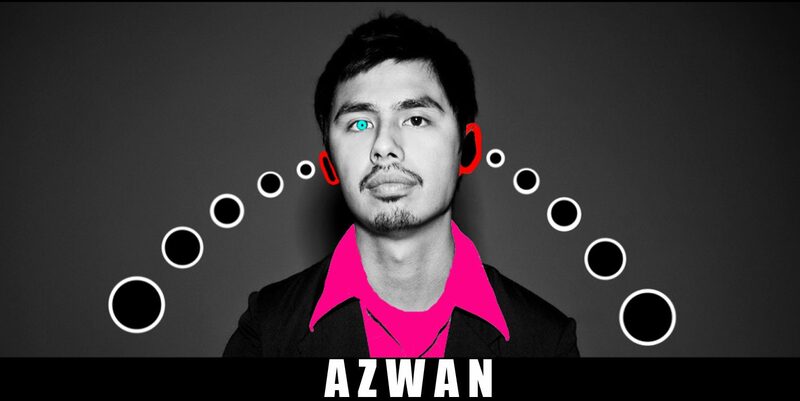 The first thing you need to know about Azwan is that he is not Aziz Ansari from NBC’s Parks and Recreation. To add to that list, Azwan is not a type of interment, animal, or African cultural practice. Truth be told, I spent several hours listening to Azwan’s music, reading over his bio, exploring his website, conducting an interview, and I still have no idea what the hell Azwan is. So maybe I shouldn’t spend this article telling you what Azwan is, maybe I should just tell you what he isn’t. Aswan is not your typical musical artist. In fact, Azwan isn’t really a musical artist at all. He is just an artist, using many different mediums for creative expression and entertainment. While Azwan began making music at age 18, he spent most of his early years in the film industry. “I grew up making a lot of home movies,” Azwan told TheCoope, “very goofball stuff, and I think that humor leaked into my early music.” And it did. While the artist himself may define his music as “silly” and “not too serious” it is clear that Azwan is an artist who appreciates music for the sense of expression and experimentation. In Azwan’s new studio release, Violent Laughter, he doesn’t restrict himself to the confines of any particular genera or music theme. His music exists simply to experiment with what can be done with music, particular techniques, and a wide verity of sounds. This brings me to my next point. Azwan is not a guitarist… or a pianist… or a singer song writer… or really anything for that matter. Despite the fact that Azwan is able to play a multitude of instruments and play them well—a skill showcased in Violent Laughter—Azwan doesn’t like to think of himself as being really an anything. “Overall, being influenced by a lot of things is great,” said Azwan, “because you don’t have to worry about limiting yourself to a genre.” This is true. In addition to being influenced by his film making past, Azwan also told TheCoope that he draws most of his musical inspiration from a wide range. This includes whatever happens to be in his CD wallet to Grammy winner Frank Ocean (#like). This wide range of musical influence is evident right form track number one of his new studio album. So knowing what Azwan isn’t, what can listeners expect of his music? Violent Laughter is the third solo album put out by Azwan. And while he never tries to “mime” any particular artist, he admits that, at times, sounds derived heavily form other artist’s do work themselves in. But it’s not so much about the sounds in Violent Laughter that make it special; it’s more about how they combine. And as you could probably guess, these sound combinations are as divers and random as Azwan’s influences. Take track one, “Tuxedo,” for instance, which sounds like a hybrid between flamboyant David Bowie vocals and a post grunge Weezer base beat. Or track four “W/ Cupid,” which is a blend of what I can best describe as early 90s hip-hop with subtle nuances of classical acoustic guitar. Track after track each song sounds different. Nearly an hour later, after having listened to the entire album, I couldn’t tell you what this guy sounds like. The album its self is incredibly diverse and original; no song sounds exactly like any other. This is both good and bad. Just because you like one track doesn’t guarantee that you will be interested in any others. But this also makes the album a much richer musical experiences. The album showcases a wide range of ideas to its listener, and serves its purpose as an experimental music creation. The only thing that is constant in Azwan’s music, is that it’s hilarious. The music is full of comedic allusions like on “W/ Cupid” when he talks about is how the only reason guys go on dates is so they can make out (#preach). And to second that, most of the tracks on Violent Laughter are relatively short. This is good, because the track is often over before the listener can get bored with the song’s comedic concept or the musical styling. Violent Laughter is an interesting mix of serious musical styling’s and comedic song material but also showcases a more developed Azwan than on past albums. “I feel more mature (some would disagree). I think the maturity will come out in my music but hopefully it’s not too serious.” The music has improved but the defining stylistic attribute of comedic attitude of Azwan remains. Even as his musical styling’s evolve, the guy still can’t stop being funny. So now that Azwan has finished his third studio album, what’s next? Azwan told TheCoope “I wanna hit the road again and after another album I would maybe like to produce a film, probably a dramedy or a film noir” But for Azwan, being as silly, unpredictable and diverse as an artist as he is, maybe it would be easier to just say what he won’t do next than what he will.